My pecan has black spot fungus. 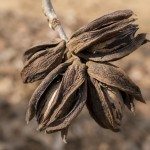 The pecans turn black and don't mature. What can I do or spray them with? This is likely a Pecan scab disease. Treatment would be difficult on your own and may require application of fungicide by a professional.